This colourful book is attractively well laid out to appeal to children. 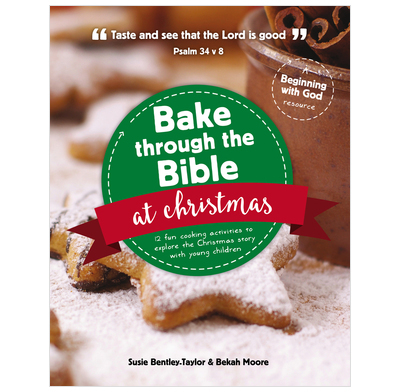 The book has a two-pronged approach; how to include and effectively target young children when you bake coupled with how to help them to understand more about the Christmas story. Each recipe is introduced using a link to part of the Christmas story; this is followed by detailed recipe and cooking instructions as well as suggestions to think about when you’re eating what you’ve baked. The book does two things very well. It includes useful suggestions about how to get your child interested and involved in baking and it also takes the reader through the Christmas story. Not only does it provide opportunities to read the story though. It helpfully prompts the reader to think through the implications of the different parts of the story then finishes each recipe with ideas of how to pray in response to what’s been read. It’s a great way to spend some quality time with your child doing an activity that most children enjoy. A chance to bake and understand more of the Bible at the same time.